I pay so much closer attention to the National League than the American League, and I got both of the NLDS dramatically wrong. To be fair, I was trying to jinx the Cubs and spite the Phillies. Yes, I have that kind of power. So do you, actually. Being a fan rules. Series Schedule Game 1: Thursday, October 9, 8 p.m. Los Angeles (Lowe) at Philadelphia (Hamels). Game 2: Friday, October 10, 4 p.m. Los Angeles (Billingsley) at Philadelphia (Myers). Game 3: Sunday, October 12, 8 p.m. Philadelphia (Moyer) at Los Angeles (Kuroda). Game 4 : Monday, October 13, TBA. Philadelphia at Los Angeles. Game 5 (if necessary): Wednesday, October 15, TBA. Philadelphia at Los Angeles. Game 6 (if necessary): Friday, October 17, TBA. Los Angeles at Philadelphia. Game 7 (if necessary): Saturday, October 18, TBA. Los Angeles at Philadelphia. SEVEN THINGS TO KNOW ABOUT THE PHILLIES-DODGERS SERIES 1. Charlie Manuel Is Comfortable With Himself. The Phillies manager, whose main qualification when he was hired was that he Wasn't Larry Bowa, has been a steadying, folksy presence in a town that could use both. This is not a place that is kind to its managers. (For the record, Terry Francona never won more than 75 games there.) Nothing seems to faze Manuel, and he has earned his stoicism honestly. Over the last 20 years, to quote Sports Illustrated, he has "had a heart attack, quadruple-bypass surgery, diverticulitis and an operation to remove a cancerous kidney." In 2000, while managing the Indians, he carried a colostomy bag next to him in the dugout, under a jacket. 2. Joe Torre, Indestructible. As strange as it might seem to not have the Yankees in the postseason, there is a certain level of comfort in having Joe Torre around, a guy who even the millions of Yankee haters can't completely despise. (Even if his genius seems to manifest itself in the act of sitting in the dugout and chewing gum.) The Dodgers are the third team Torre has brought to the postseason, but it's his fifth job overall. We Cardinals fans will remember his string of middle-division finishes in the early '90s, but I'd actually forgotten he got his start with the Mets in 1977 as a player-manager. Anybody else miss player-managers? Wasn't the existence of player-managers an implicit admission that managing a baseball team really isn't that hard? Who would be a player-manager now? Jason Varitek? Craig Biggio might have been reasonable, were he still around. The Brewers really should have just hired Ray Durham. 3. It's Pat! It seems strange to think of how unpopular Pat Burrell was in Philadelphia a few years ago; he's now the veteran slugging two homers in the NLDS clincher. Everyone's come around in recent years, because: 1. He's hitting the crap out of the ball, and; 2. The reputation born out by this story, told famously by Daulerio in his Deadspin season preview a couple of years ago. "The story goes: A few guys were on a business trip in Pittsburgh. A couple of the guys knew the Phils were in town, so when they all spotted Burrell at a club there one night, it wasn't a total surprise. Pat ended up taking a liking to one of the girls in their group. She thought he was hot but didn't follow baseball. He took her back to his hotel room, and a make-out session ensued until she alerted Pat that she would NOT do him. Not fazed by this, Burrell seemed to respect her chastity, and rather than force himself on her or fly into a blueball rage, he asked a simple question, glancing down at his engorged pants: "Mind if I take care of business?" Hey, we've all been there. 4. If Only Andruw Could Have Been Here. The Dodgers already have more outfielders than they need — Joe! Keep Pierre on the bench! You know this, in your heart! — but it's still worth reflecting on just how horrible Andruw Jones was this year before the Dodgers did the mercy kill and ended his season. Jones, who 51 homers just three years ago, batted .158 with three homers and 14 RBIs. In 209 at-bats, he struck out 79 times. Whatever happened to him — and there are plenty of suspects — it's one of the most amazing things I've ever seen happen to a baseball player. He might have been overrated before, but honestly: The guy has made five All-Star teams this decade and is still only 31 years old. (That's only a year-and-a-half older than Chase Utley, as a comparison.) But hey: He'll make $15 million next season. For fun, check out this MLB Blog "written" by Jones at the beginning of the season. For some reason, he didn't end up doing many posts. Hmm. 5. Sorry. It's The Postseason. It Has To Come Up. 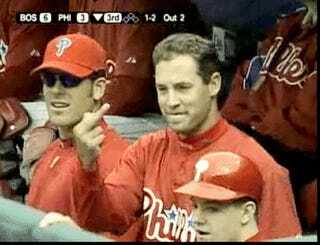 Brad Lidge settled down after his somewhat shaky first postseason appearance, but if Manny's up in the ninth with the bases loaded, two outs, and the Phillies up by one or two runs ... I still know where I'm putting money. Well, other than under the pillow. 6. Jamie Moyer Is Awesome. For the record, here are people who played with Jamie Moyer on the Cubs in his first year in baseball: Jody Davis, Ron Cey, Davey Lopes, Terry Francona, Dennis Eckersley, Steve Trout, Lee Smith. Oh, and Greg Maddux, of course. Moyer will actually turn 46 in November, and is a free agent after the season. He's certainly pitching well enough to come back; he notched his lowest ERA since 2003. (He actually pitched one season for the Cardinals, for Joe Torre in 1991. He had a 5.74 ERA and then missed all of 2002. You have to love a guy who thought his career was over because of injury 16 years ago. Oh, and his father-in-law is Digger Phelps. 7. Hey, The Dodgers Feel Pain Too. Everyone acts like the East Coast has some sort of patent on sports suffering — mainly because everyone out here is more miserable, generally, as a rule — but the Dodgers haven't exactly had the best couple of decades. Their last World Series was 20 years ago — yes, the Gibson-over-Eckersley year — and before their sweep of the Cubs, they had gone 1-12 in the postseason since then. Every team in the playoffs other than the Rays had won more postseason games than the Dodgers over the last 20 years. If you were a Dodger fan born any time after 1985, this is the first time you've ever had anything to celebrate in October. Not for nothing. PREDICTION One gets the sense that, for the first time in a while, the NLCS is going to be more fun than the ALCS. No matter what, this series is getting back to Philly in a week-and-a-half. If the Phillies can avoid putting themselves in that Lidge-Manny moment ... Phillies in seven.